Chris Alston's Chassisworks, Inc.; - Mustang 67, Ford/Mercury 66-67 - Strut Rods, 20-1/16"
Now In: Total Control Products (Classic Ford) → Suspension, Front → Strut Rods → Mustang 67, Ford/Mercury 66-67 - Strut Rods, 20-1/16"
Mustang 67, Ford/Mercury 66-67 - Strut Rods, 20-1/16"
Tubular Strut Rods with TrueCenter Pivot - Fits 1967 Mustang and various Ford/mercury models from 1966-67 with OEM or TCP lower control arm. 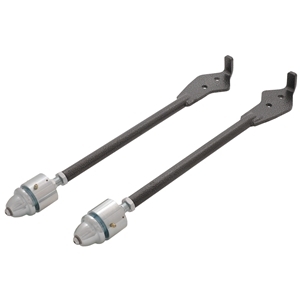 Strut rod has 20-1-16" overall length with inline bolt pattern. Ships with silver-vein hammertone powder coat finish and mounting hardware. Mustang 68-73, Ford/Mercury 68-77 - Strut Rods, 19-15/16"
Mustang 64-66, Ford/Mercury 60-66 - Strut Rods, 17-15/16"